Yet another science cookie, this time Gel Electrophoresis! These are for fellow blogger Mylifeinbrown, who suggested the idea and I just love how these turned out, so thank you very much. I'm still plotting ways to do gel electrophoresis with gelatin. I just need to figure out a way that both tastes good and looks respectable. Electrophoresis 'jigglers' would be hilarious so I must figure out how to do it. These are more of Martha Stewart's sugar cookie cut outs, my go-to sugar cookie recipe (you can find the recipe here). Although, I prefer to modify my dough with a half teaspoon of almond extract to give my cookies a little more flavor. Tint 1/3 of a cup of the icing pink to make the markers and the remaining 1 and 2/3 cups with royal blue and pink to create a background that will vaguely simulate what the gel looks like under ultraviolet light. Using your purple icing, pipe a square outline on each of the cookies and allowed it to set. Given the consistency of your icing should take at least 10 minutes, probably longer. Then thin the remaining purple icing with a little bit of water and flood each of the squares. Before the purple icing has set, use the pink icing to pipe in the little lines to create the markers. Allow the cookies to dry overnight. 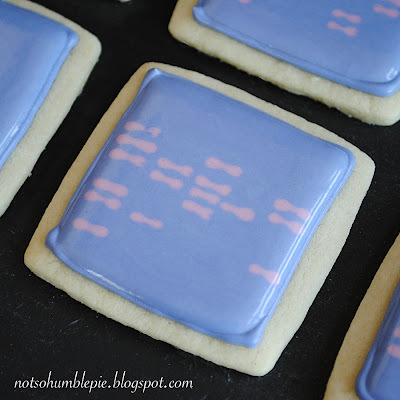 You've got Gel Electrophoresis Cookies! Now, the markers on my cookies are completely random gibberish of course. I'd love to do these and replicate actual microbiology gels. Hehe, so nerdy and cute. I really like the colors that you used. Btw, jell-o electrophoresis would be so so awesome :). So adorable! Love these. I wonder if you could do the jigglers one by making the base out of a pale-colored jello, and then when it's semi-jelled, push in the markers which could be made out of some sort of sugar confection, or jimmies (those long sprinkles), or little batons of fruit - maybe apple? Whoa--Dead ringers for gels! How awesome! And I'm guessing they taste better than agar? Taste better than agar? Hmm, I am not sure. Would anyone know? How many people eat their agar or agarose? I might be going out on a limb here, but I am going to guess that licking one's figures during bench work could be considered bad technique. These are perfect! In my biochem lab we had a 'chocolate challenge' where if your gel was better than the teachers, then he'd give us chocolate and if his was better, then we'd have to give him some. My team lost and I still owe him chocolate, but I think I'm going to make him these too! Actual DNA Geek here!!! These cookies look great. The only thing that's 'technically' wrong with them is that the first column is supposed to be the same on all of them, as they're the known segment length of DNA so that we science geeks can calculate the unknowns. Agarose gel would taste horrible. The smell of just mixing it is enough to make you not hungry for hours. As for your jello jiggler gels, I was thinking you could just mix some clear jello, and then when its semi-gelled use some blue jello (or red or yellow, common marker dyes) and a pipette to put some little lines in. Amazing, simply amazing. I bow down to your cookie prowess and nerdiness. I've never met you or been to this site before, but you are clearly awesome. I absolutely love all of your science adventures in baking! Errr maybe the other way around? Anyhoo, all of these cookies are adorable! PZ sent me over but I added your blog to my favorites and plan to come back without his prompting. Those cookies are so cute! I loved all of the science ones but there is something very lovely about these. I have been thinking about making cookies a lot lately, now I will have to be creative and try to match this! Ah these are adorable and (as someone who has done a lot of electrophoresis) the coloring is just right! You are my hero! !I can't belive you made these cookies! I'll have to steal the idea to give out! Oh my gosh!! These are amazing, and the streak plate ones are unbelievable too. I am definitely going to make these for my classmates in my microbiology labs. Awesome job. Love these! Gonna have to make a batch tonight for a friend that just passed her quals. I have made jello ones, but never thought to turn them into cookies. For the jello I used the almond jello and lightly tinted in with food coloring. I poured it onto a large rimmed cookie sheet, let them set-up a bit(but not too much), then used a syringe to pipe in the lines. If I was going to do it again I might try using a toothpick or something to cut out the areas I wanted to put the second jello into as it might be easier. Then you just unmold and cut into the right size. Voila! Thanks for the science cookies, nice to find other nerds with a similar passion for baking. Wow- these are incredible. Actually, you can eat agar (it's vegetarian "gelatin"), but the ethidium bromide you need to add to make the DNA fragments glow would do you in. Honestly, I'd never noticed how compatible baking and biology were until my lab made a cake with a worm gonad done up in candy. Thanks for expanding my horizons! I love the ideas, thank you! I am a bit lost for ideas. I thought about Feynman Diagrams as I used to work in particle physics but I would love to make some sort of mass spectrometry related cookies to bring to our mass spec group meetings. But I am finding ideas for that difficult. These cookies (along with your other biological baked goods) have to be the greatest things I've ever seen. I'm currently in 10th grade, taking AP Bio. We're just doing a gel electrophoresis lab this week. I love biology, and I love baking :) So, I think you are fantastic! You just made science sounds like fun! These are awesome. Gonna make some (and the streak plates) for our lab party. *Pssst* Just a heads up, I'm not Irene. I'll still take those hugs though, if you don't mind. Oh my! These are absolutely fantastic. I'm a biochemistry major and just had my genetics final tonight and needed to know the process for this! I also work in a lab where all I do is PCR for hours. Seeing these cookies has truly made my evening. Your science goodies always make me smile. And as an aside, I've tasted agar as a gelatin substitute. Blech. I can't imagine agarose would be any better. Oh, and wouldn't this be PAGE gel for the optimal resolution? They're nowhere near as beautiful as yours, but in our defence, it was our first experience with royal icing. And the first time we'd iced cookies since we were about 7 years old. PS. Your other recipes are amazing, I've never seen so much amazing food on one blog. And I also love that you make things from scratch - big respect. I will definitely be keeping an eye on your blog in future. Most of my friends are science nerds and both my parents are scientists too. So you know what everyone is getting for holidays! Mine won't be nearly so beautiful, but that's okay. Espresso cookies decorated with the chemical formula for caffeine? My mom would be so amazed! And I laughed out loud at licking your fingers at the bench. Ewww! I used to drink tea at the bench, until that time I ejected a tip into my cup and almost didn't notice. Mmmm, tasty polymerase! suspend extra thin slices of gummy worms or gummy fish inside jello cubes- Eh, voila! Give it a try! AMAZING! i am a fellow science nerd - I LOVE ALL YOUR COOKIES! so awesome. going to try making some over the holidays, so thanks for giving me something to look forward to!! I was just sent this link by a coworker. These are amazing!! I wish I knew you. I too am a molecular biologist turned stay-at-home mom. I can't wait to look over the rest of your blog. Very neat cookies! 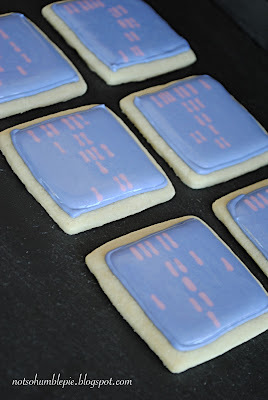 !I was lead to your post from a friend on Twitter because these cookies reminded them of DNA 11(the company I work at). 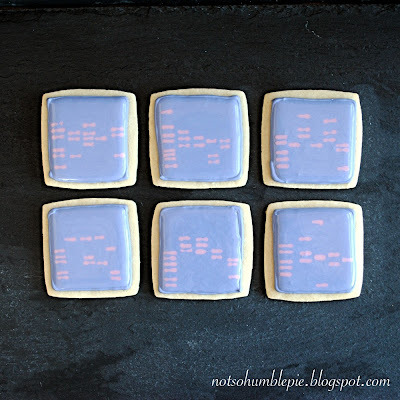 If you like these science cookies you should check out the custom genetic art they can create from your DNA. I love the cookies. Great Idea for work. I wonder how I could make cookies that look like beakers, flasks, or test tubes...any Ideas? i love biology and labs and WOW i can't wait to make these!!!! Now THAT is what I call creativity. Yum!! These are awesome!!! I love the way you got the bands to look just right! To make a gel version of these, you might try using a kanten recipe (Japanese dessert that uses agar as a base)--they sell the agar for kanten at Uwajimaya in Seattle. That is just simply amazing!! the way the genetic markings are done, it's just like the real thing!! Sorry that's the Geek side in me but I very much admire your work!! Fantastic!! 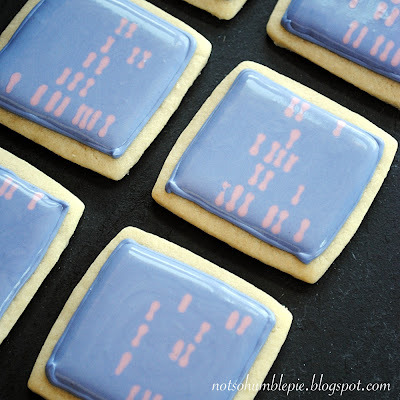 A friend sent me the link to this post, and I just think your electrohoresis cookies are hilarious. I wished that I had thought of that when I taught AP Biology. The Jello jiggler idea would be awesome. I think I'm going to make petri plate jello now. Thanks for the inspiration! what about jimmies in jello? No better way to enjoy science than eating it in a sweet, delicious looking cookie. Love it! I adore this idea. I am going to have to make these. Scientists Rock. My husband and I are both science nerds who invited lots more science nerds to our wedding last March. Made these for our cookie table and they were a hit! Thanks for the great idea. Cookie pics are posted on our photographer's blog. Thanks to the recent recognition of your genius in The Scientist Magazine - I'm a new subscriber to your blog. I LOVE IT!!!! I just LOVE IT!!! I'm a grandma whose PhD (molecular evolution) came after the grandkids ... This will be my newest way to infiltrate the lives of my granddaughters (ages 7 and 4) with some very cool science! I think you could do this with gelitan by using the stained glass method. Rather than just putting the blocks in willy-nilly, you could arrange them, and then pour the white mixture around them. I know this is an old post .... but I just want to say how happy it makes me! I'm totally going to make these when I do my PhD prelim exam.